PETALING JAYA: The property market will not be impacted by the recent increase in the overnight policy rate (OPR), said property consultants. Last Thursday, Bank Negara raised the overnight policy rate (OPR) by 25 basis points to 3% and increased the statutory reserve requirement (SRR) by one percentage point to 3%. Henry Butcher Marketing Sdn Bhd chief operating officer Tang Chee Meng said the slight increase meant that borrowing cost was still reasonable. “With banks offering base lending rate (BLR) minus 2%, this means effective interest rates are still below 5%. However, property investors will look at the slight rate hike with caution,” Tang told StarBiz. He pointed out that demand in the property market might be curbed slightly if the central bank raises the OPR by another 25-basis points before year-end. “Property investors look closely at micro situations and factors such as location, possible further interest rate hikes in the short-term, rental yields and capital appreciation,” he said. Zerin Properties chief executive officer Previndran Singhe said the recent rate hike was not significant. KGV-Lambert Smith Hampton Sdn Bhd director Anthony Chua said the rate hike would not “put brakes” on the property market. “It will not have a significant impact, although there may be some minor adjustment in buying sentiment,” said Chua. CB Richard Ellis (CBRE) Malaysia managing director Allan Soo said the impact on property buying sentiment would be negligible. “At this level, the property market is not interest sensitive,” Soo pointed out. CBRE Malaysia executive director Paul Khong pointed out that property prices, especially in the Klang Valley, still soared despite a rate hike last July. “Property buyers will continue to make decisions based on their repayment capability, and also factor in their expected rental yields in view of the rate hike,” said Khong. PETALING JAYA: Ho Hup Construction Co Bhd's unit has extended the timeframe for the conditions precedent to the proposed disposal of its 3.32-acre freehold land in Bukit Jalil. In a statement to Bursa Malaysia yesterday, it said that its 70%-owned subsidiary Bukit Jalil Development Sdn Bhd and Bayu Melati Sdn Bhd had mutually agreed to the timeframe extension to up to May 20. Ho Hup gained its shareholders' approval for the land disposal for RM9.55mil cash to the unit of Melati Ehsan Holdings Bhd in February. The proposed disposal was part of the company's exercise to dispose of all non-core land bank. 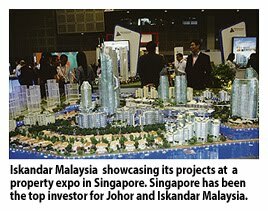 Kuala Lumpur: The outcome of the recent general election in Singapore could spell the end of many Malaysians landing good-paying jobs there and worse, put a dent on foreign direct investments (FDIs) in top notch projects here such as Iskandar Malaysia, an industry observer said. Provectus managing principal Sreedhara Naidu said the election, which saw the People's Action Party (PAP) lose 40 per cent of the votes, meant that Malaysia's dependence on Singapore's FDIs could also see a slight fall within the next three to four years as the island republic looks more inward in terms of investments. He suggested that the government create more skilled jobs as Singapore immigration rules may be tightened, making it difficult for Malaysians to land jobs there. "FDIs into Iskandar Malaysia and job opportunities for Malaysians, particularly in Johor, could be affected by last week's Singapore general election outcome as the Singapore cabinet addresses key election issues that lost them 40 per cent of popular votes. "With only 60 per cent of voters happy with PAP, the leadership will pull out all stops to quickly remedy immigration, housing, urban poverty, health services and education issues. "They may choose to tighten skilled and semi-skilled foreign worker intake, which will affect Malaysians' skill pool with Sijil Pelajaran Malaysia to diploma education that have traditionally looked to Singapore as an attractive destination (for employment)," Naidu said. Iskandar Investment Bhd chief executive Datuk Syed Mohamed Syed Ibrahim, when contacted by Business Times yesterday, disagreed. He said investments into Iskandar Malaysia would not be affected by the election outcome. He, however, did not elaborate. Iskandar Regional Development Authority chief executive Ismail Ibrahim, meanwhile, reiterated that Singapore has been the top investor for Johor and Iskandar Malaysia. "From 2006 to February 2011, Singapore registered a total investment of RM3.49 billion in manufacturing. For the services sector, until today, investments from Singapore was RM463 million in healthcare and education," he said. Ismail added that the total cumulative committed investments into Iskandar Malaysia was RM73.24 billion from 2006 till the second quarter of this year. Of this, 59 per cent was domestic investment while the rest was foreign. "So far, 40 per cent of the total committed investments has been spent on projects and developments. Investments came in from countries such as Australia, Singapore, Abu Dhabi, Kuwait, United States and India," he added. Provectus is a performance transformation specialist which has advised Iskandar Malaysia, the Economic Planning Unit, the Prime Minister's Department on the Economic Transformation Programme, Government Transformation Programme, Sabah and Sarawak Bumiputera development and other programmes. Elaborating on his views, Naidu said the Singapore government is expected to invest in new rail-based public transport, housing for locals, and more education and health facilities. "Interestingly, these are the very same investments that Iskandar Malaysia is targeting to attract from Singapore businesses and government funds," he added. Hence, he said, Iskandar Malaysia should now look at other countries such as China and India for investments in the future. "It would be a paradox for Singapore to focus on external investments for commercial reasons when local social demands are not met. That would not be palatable for the population and the six new opposition parliamentarians will lose no time in pointing these out." Naidu said Iskandar Malaysia aims to attract investments worth RM73.3 billion in the next five years, much of it from the Middle East, India, Singapore and China. "But in reality, most it would come from Singapore businesses and government agencies. "Relationship with Singapore, which has improved since Prime Minister Datuk Seri Najib Razak came to power, was supposed to facilitate faster and bigger investments from Singapore. "But the (recent) general election changes everything and Iskandar Malaysia has to re-strategise. "Even our Ministry of Human Resources will have to conduct an assessment on the potential impact as many young Malaysians may soon find it harder to land good-paying jobs in Singapore," he added. PETALING JAYA: Metroplex Holdings Sdn Bhd's suit against Sunway Real Estate Investment Trust (REIT) and seven other parties in relation to a building ownership dispute has been set for hearing at High Court Kuala Lumpur on May 27. In a statement to Bursa Malaysia, Sunway REIT revealed that Metroplex was seeking, among other things, to nullify its purchase of Putra Place. The plaintiff argued that Sunway REIT, being a trustee to unit holders and as a trustee could only take instruction from its beneficiaries through procedures in the Trust Deed dated May 20, 2010, the Capital Markets and Services Act 2007 and also the Guidelines on Real Estate Investment Trust issued by the Securities Commission on Aug 21, 2008. Hence, any action by Sunway REIT which breached the law was invalid. Sunway REIT had bought Putra Place, a mixed-development comprising a shopping mall, hotel and office in Kuala Lumpur for RM513.95mil in a public auction earlier this year.